I have visited this place previously three times -- April 22-23, 2005, July 7-8, 2005 , and Sept 3-5, 2005. So why go back again? Because I like it there! Conditions on this trip were pretty much halfway between the first two trips last year. Apparently the heavier snowfall and later spring this year neatly compensated for the calendar date. Quick summary of trail conditions and route... North side of the loop was snow-free to well past the first meadow at the top of the switchbacks. 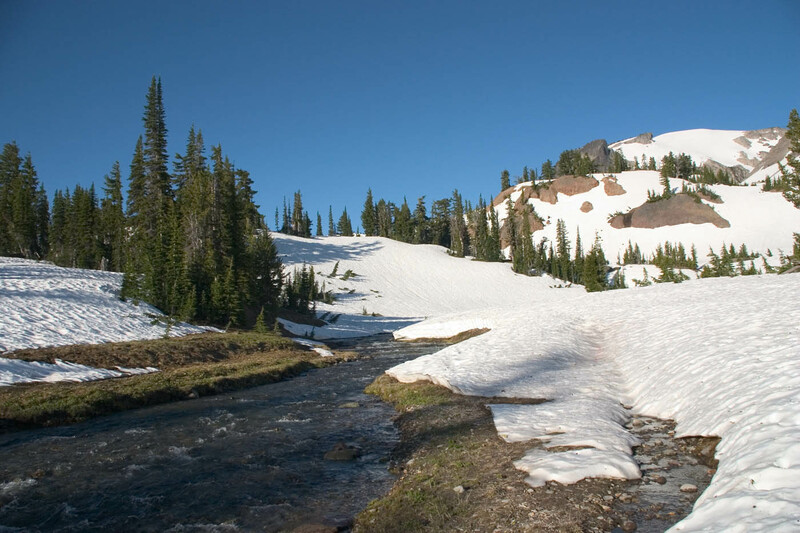 Spots of snow obscured the loop trail approaching the South Fork Tieton crossing. 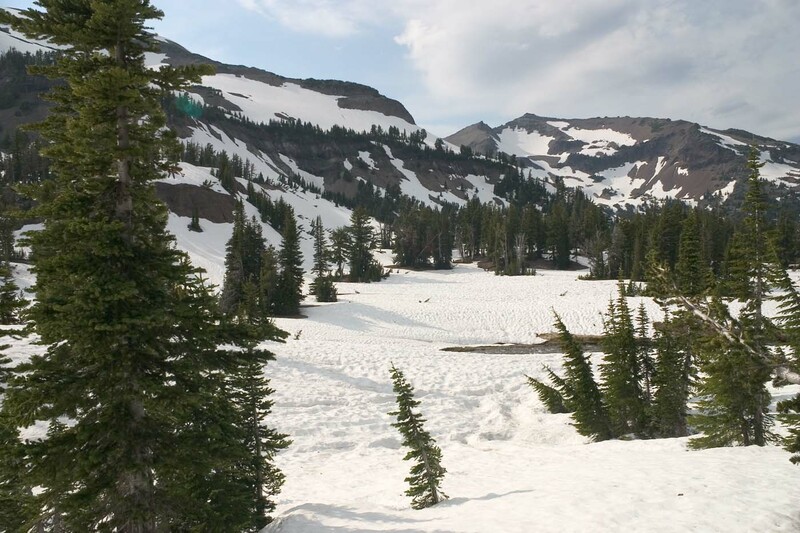 Shortly past the crossing, and before reaching the hiker trail to the Conrad Basin, snow completely covered the loop trail and made it impossible to follow. 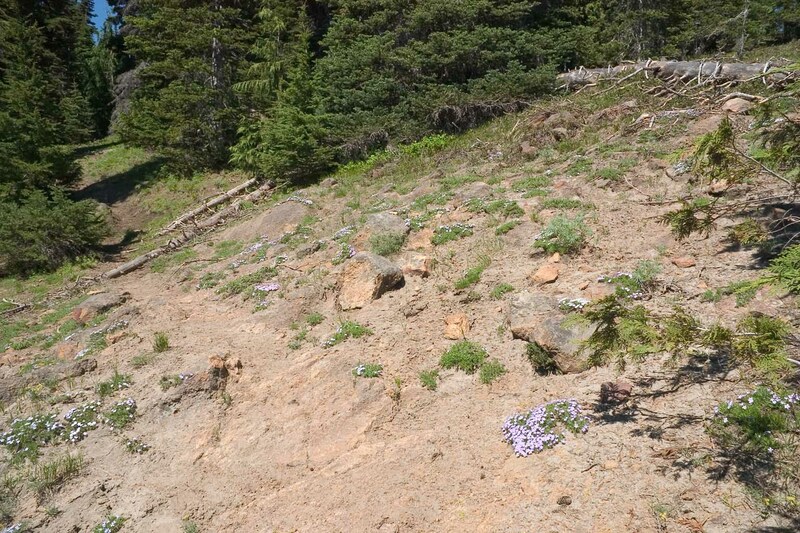 I backtracked to the meadow and started up the horse trail to Conrad Basin. 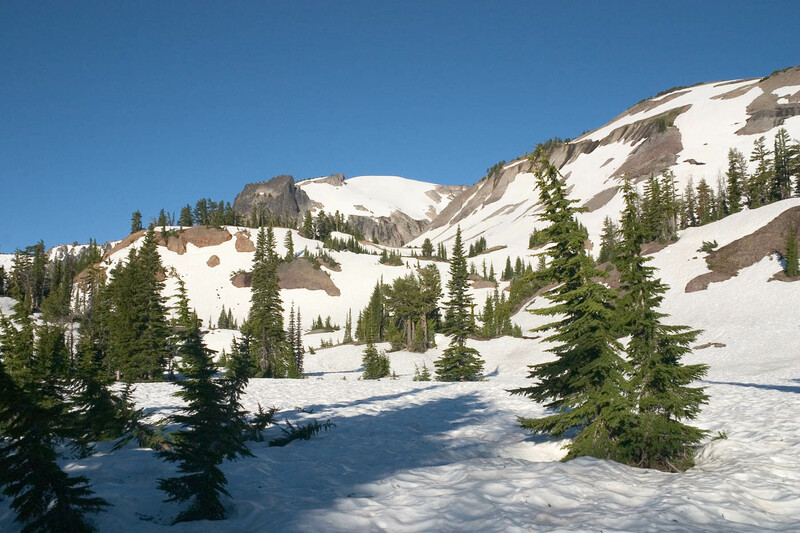 About 400 feet higher, that trail became covered with snow also, but the forest was sufficiently open that I just bushwhacked along the ridge until I could cut over to the Conrad Basin. The flat there appeared completely snow-covered from a distance, but in fact sheltered areas under trees had already melted out. 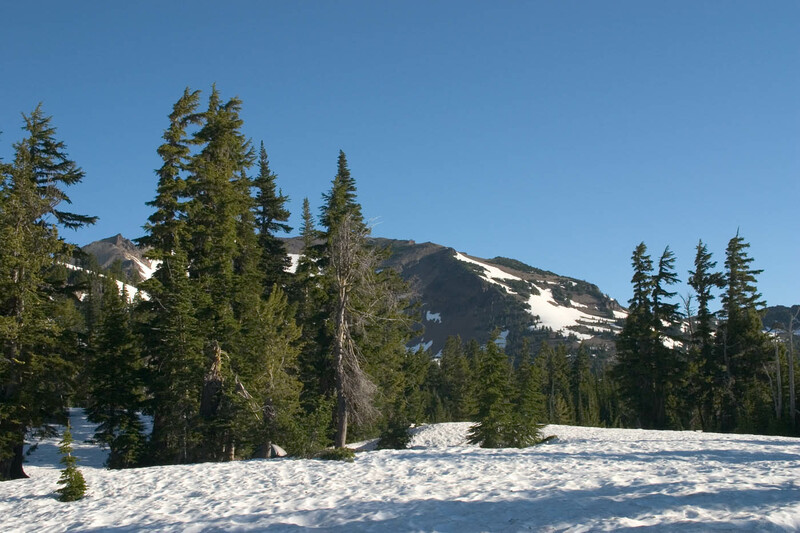 I used the same campsite as July 2005 and was able to put the tent on bare ground, although I had to kind of shoehorn it in between the trees and a 6-foot-tall snowdrift. Overnight was warm, certainly above freezing. Snow conditions everywhere were ideal for hiking -- very firm but not crusted. On top, there were fresh large elk tracks that had pressed in less than two inches. I think I postholed only twice, in the trees. Return the next day was a bit more interesting because I tried to bushwhack back out by eye and ended up getting stuck off-route twice, once above cliffs that I needed to be below, and then below a flat that I needed to be on. I confess, checking where I was then versus the previous day's GPS track saved some time. The north side loop had not yet been maintained, roughly 15 trees down. Large wildlife was limited to a total half-dozen elk on three sightings. On the lower meadows, no cows yet. The grass was beautiful. 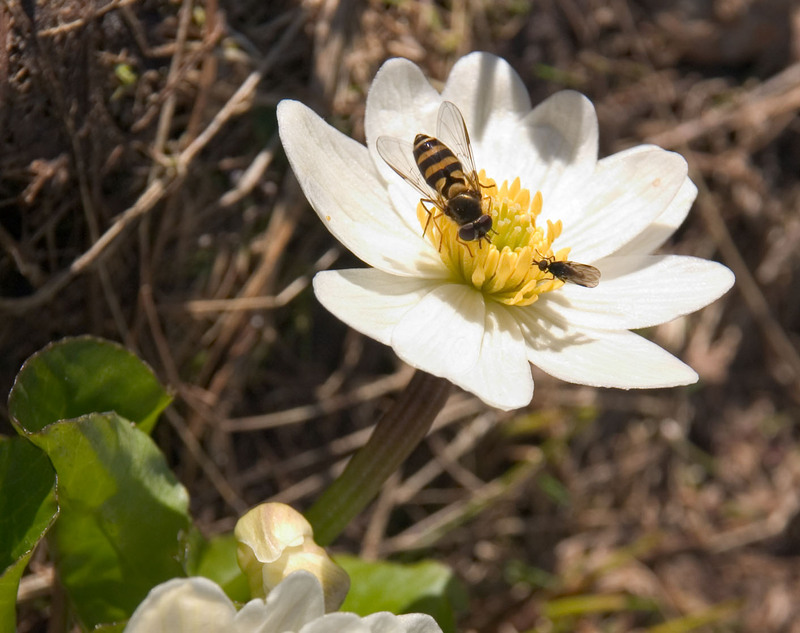 Quite a few insects below snowline, but flowers still very early, not many kinds in bloom. I did not see any other hikers, but I did keep running across one other set of fresh boot tracks on top. They looked so much like my own that I wondered for a while if I was going in circles! 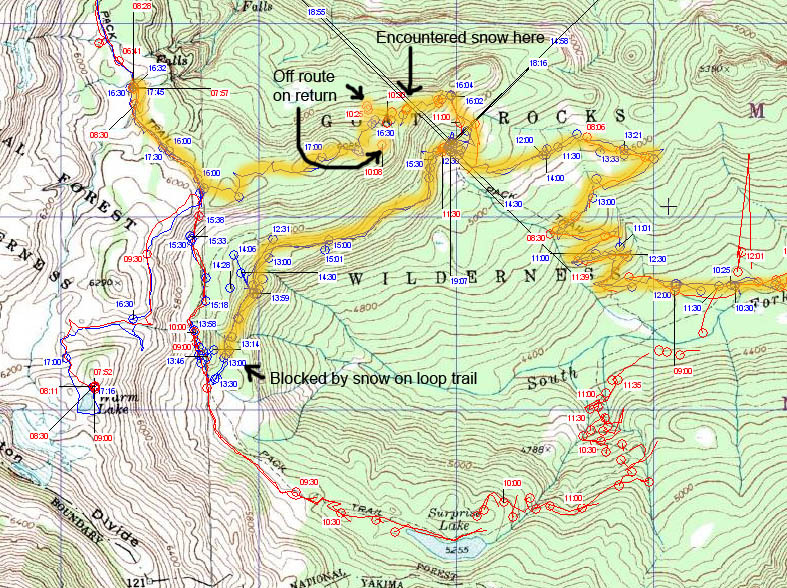 There were at least two sets of horse tracks on the north loop and partly up the horse trail to Conrad Basin. I encountered two people on horseback on the north loop, several horses and dogs on the lower trail. At the fork, going in, I talked with two young Forest Service men who were going in to clean the Surprise Lake side. I saw them again coming out the next day, and they said that had gotten it clean to the lake. 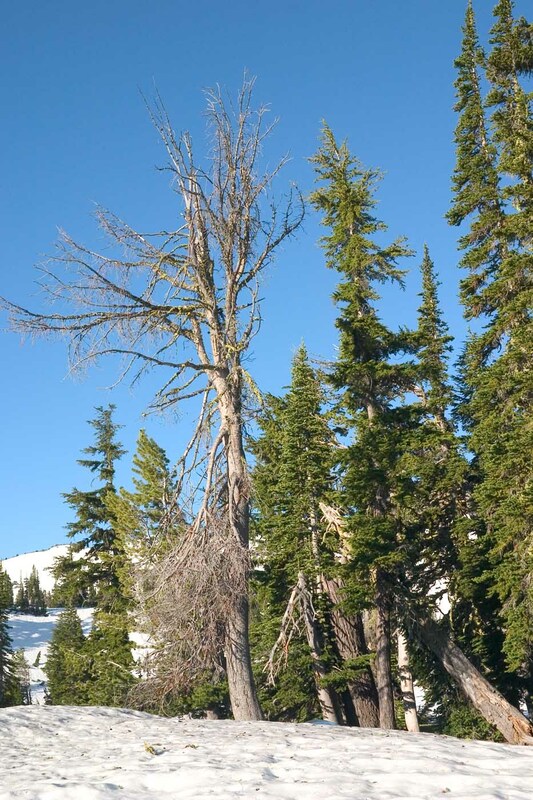 They were frustrated by budget cuts that had reduced the crew from six men last year to two men this year, making it impossible to get the trail in good shape for anticipated heavy use over the 4th of July weekend. Their version was that not only were there overall budget cuts, but that most of what money there is, is going to the "front country" crews who maintain the wheeled-vehicle routes. Here's the map of the route (some tracks from previous trips!). First view of the Conrad Basin flat, around 5:30 pm. The sky was partly cloudy all of the first day. 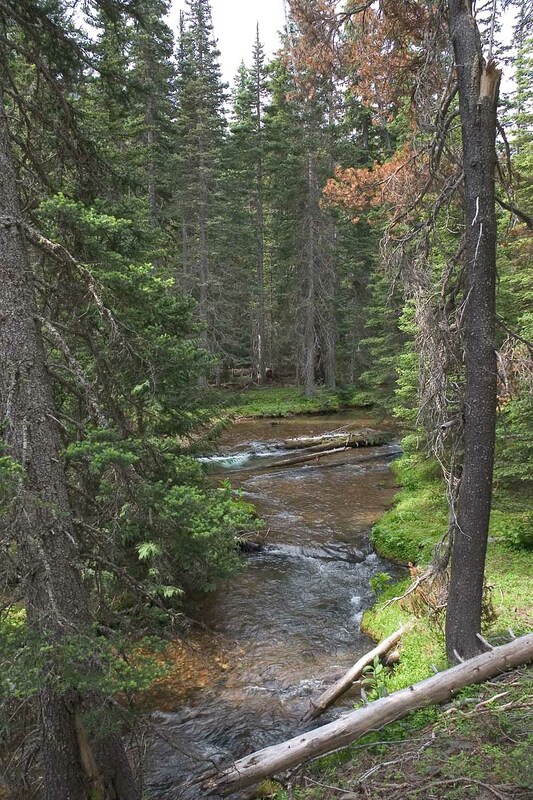 This is the creek coming down from the Warm Lake area, which I had to wade to get to & from the campsite I wanted. Soaked my boots going in, but they dried nicely overnight. Coming out, I changed into running shoes to keep boots dry. The dry part was good, but dang! that water is cold in running shoes! This picture and all others of this area were shot on the morning of the second day, which was completely clear. Meade Glacier at top center, the rest is all snow that will melt in a few weeks. 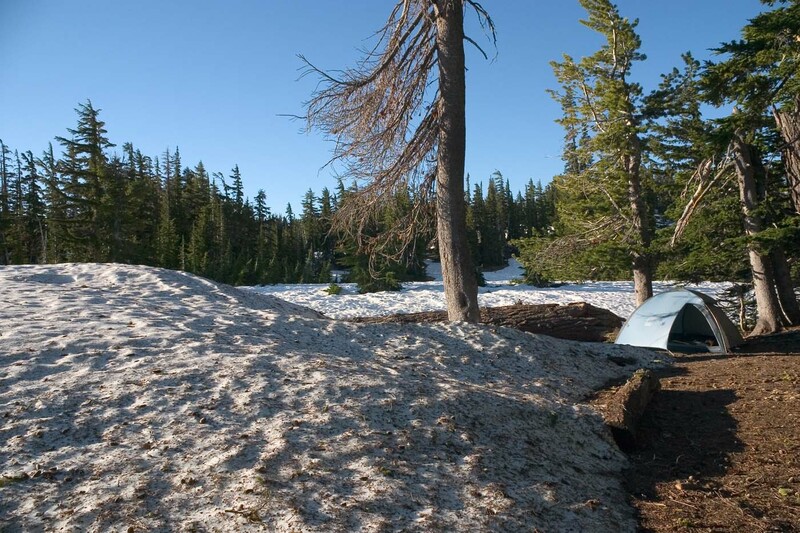 The campsite, up close, snowdrift at the left in this picture. The campsite, from 50 yards away. 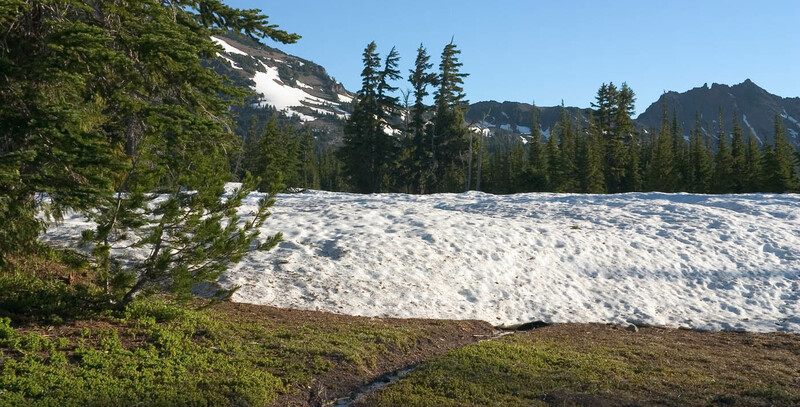 The mound of snow to the right of the tent is in fact all snow -- the ground is very level here. Arrowhead Blues (and one ant!). See also http://www.photomacrography1.net/forum/viewtopic.php?t=5262. 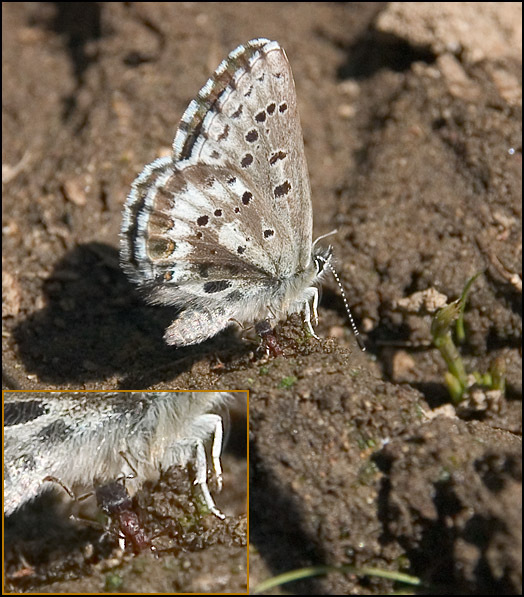 A severely deformed specimen, all wings very curled and non-functional. 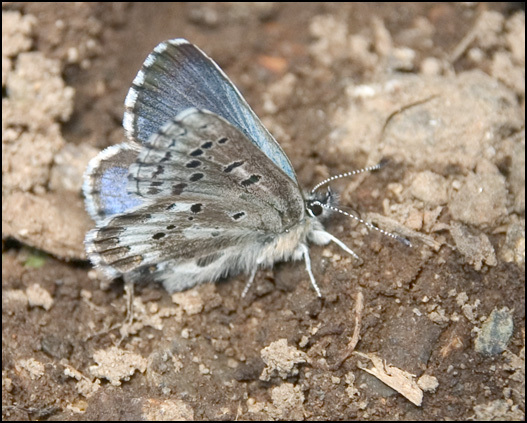 Arrowhead Blue with very hopeful ant! 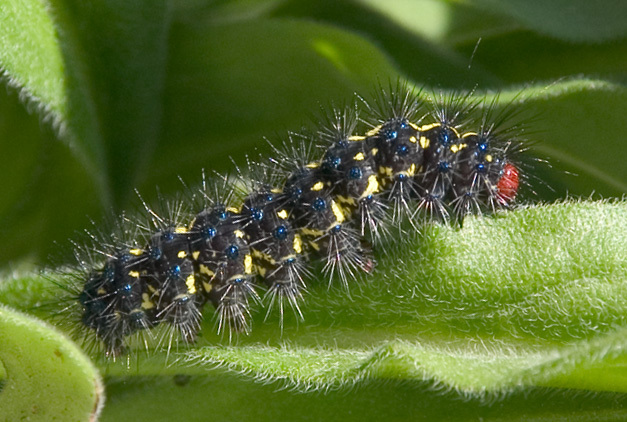 Flashy caterpillars on Forget-Me-Not. See also http://www.photomacrography1.net/forum/viewtopic.php?t=5273. 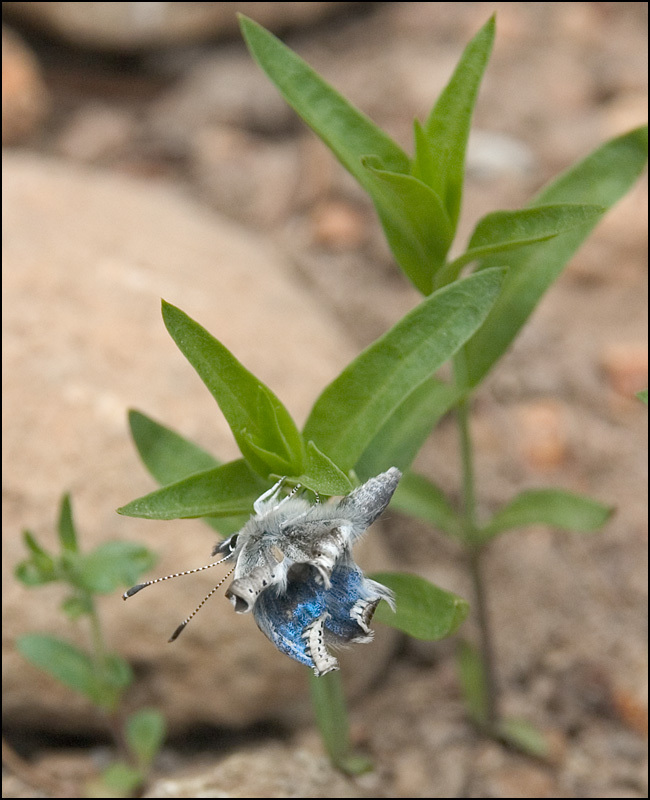 This is a non-denuded Forget-Me-Not of the kind the caterpillars were on. 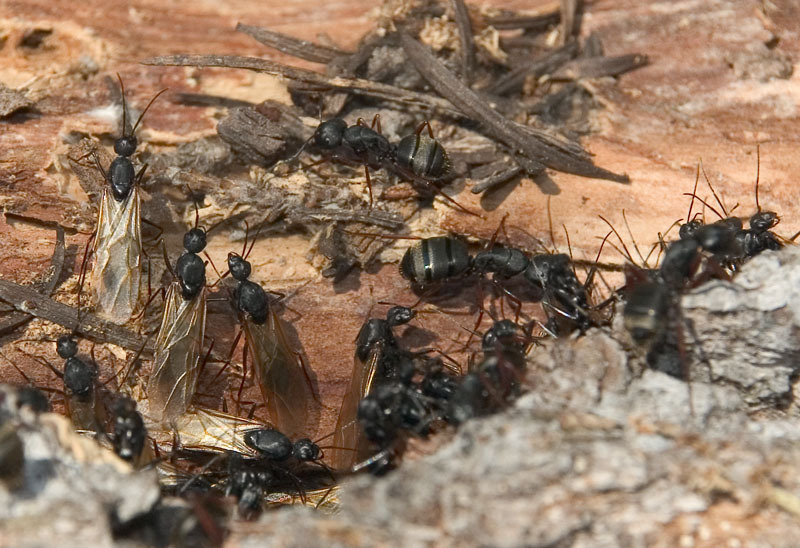 Carpenter ants. See also http://www.photomacrography1.net/forum/viewtopic.php?t=5277. 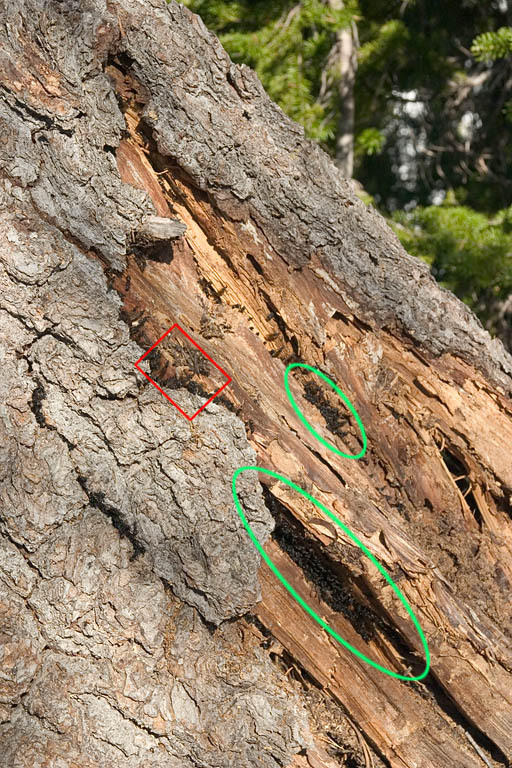 The above closeup was actually just one small part (red rectangle) of a much larger collection of ants (green ovals). At the creek on top. 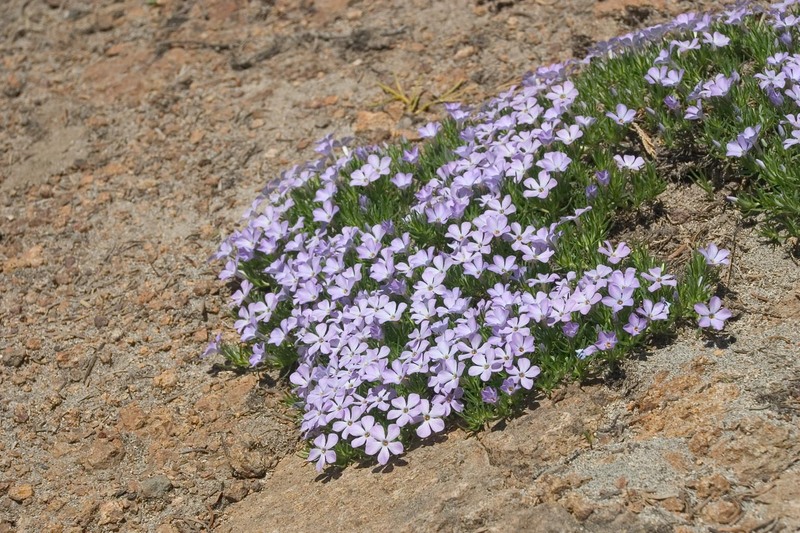 This purple flower was pretty much all that was out in quantity near the top. 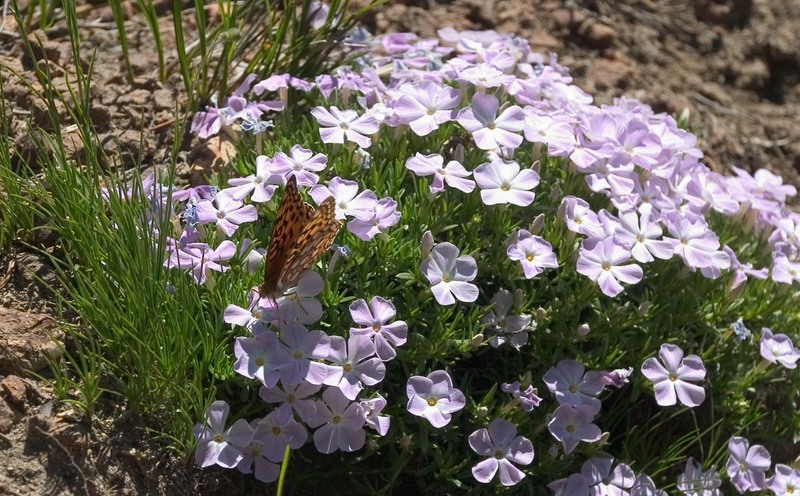 This picture is on the horse trail to Conrad Basin, a couple hundred feet below snowline. 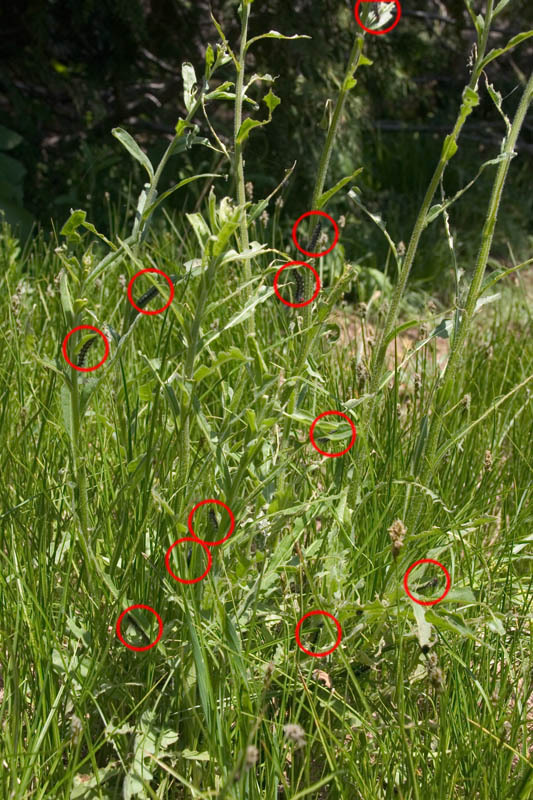 Closeup of the bunch at lower right in previous picture. There were even some Speyeria around. 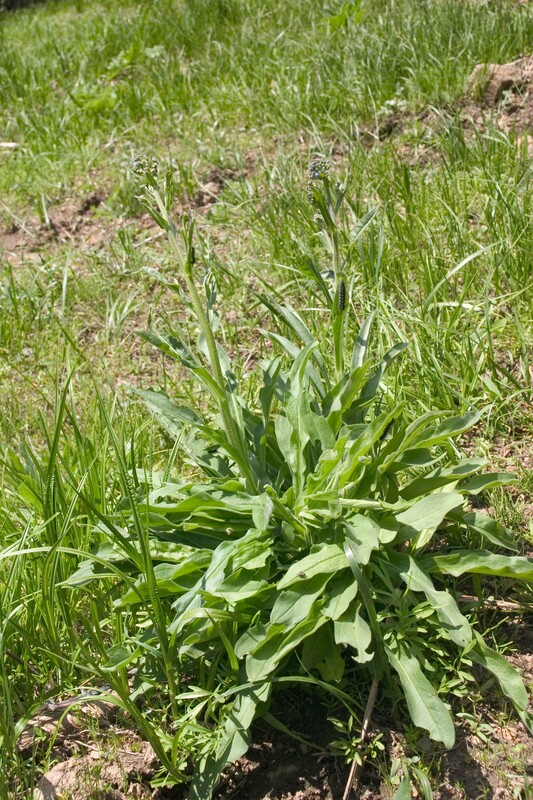 S. zerene, perhaps? Apparently salt is a precious commodity. 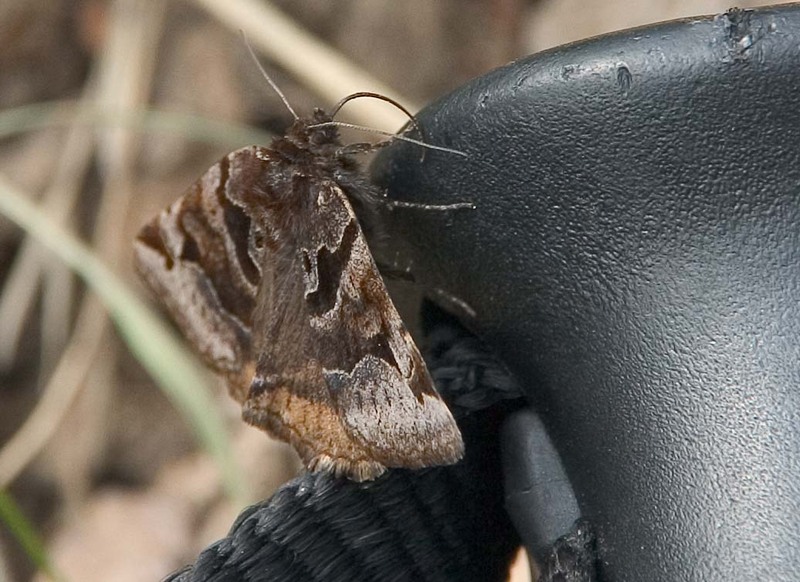 This little day-flying moth really liked the handles of my trekking poles. 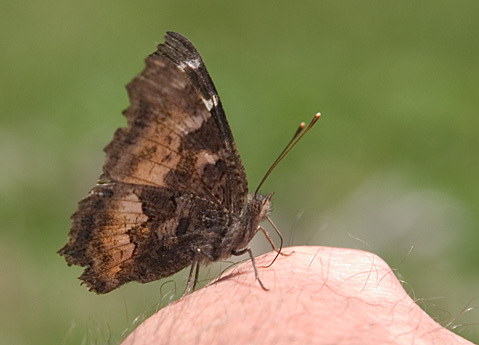 This Tortoiseshell butterfly took a rather more direct approach. I had to shoot this left-handed -- the skin being slurped is my right index knuckle. These butterflies were not deterred by the deet insect repellent on my hands or shirt. Anything else? Oh yeah, the "basic stupidity" story. 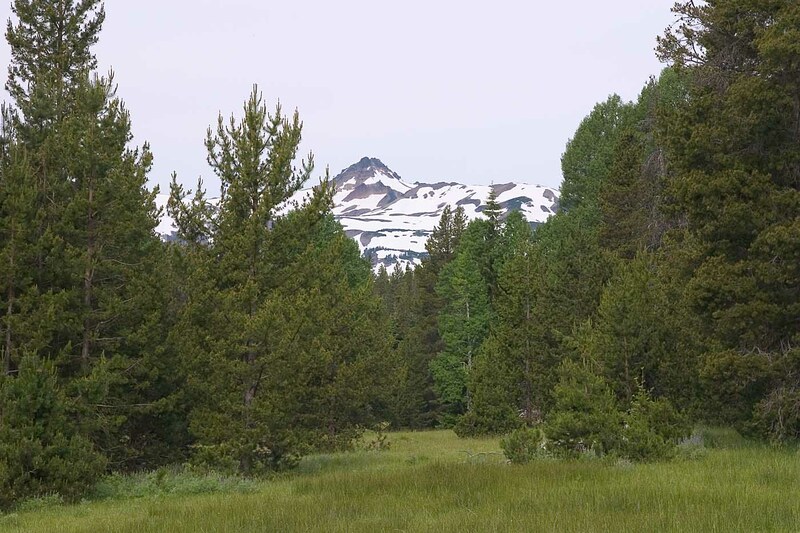 Coming down, I realized at noon at the meadow that my wallet was not in the upper pocket of my pack, where I had put it when starting out. I ransacked my brain for all the places where I had had that pocket open and might have lost it. I found that most of them were still accessible, albeit with a bit of backtracking, but no joy -- and no wallet. I ate dinner on the trail, having no money to buy food on the return trip, and resigned myself to spending a day or more canceling and replacing various cards. Most annoying. The wallet was hiding behind a label in a pocket of my tent -- folded, rolled, and bagged. The one place I didn't think to look. Fortunately I unpacked everything before canceling those cards.